This model is discontinued, please check out our single output model HY5005D or HY5020EX (0-50V, 0-20A). 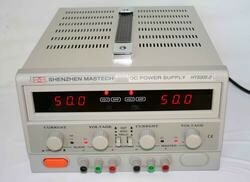 MASTECH HY5005-2 is a lab grade DC regulated switching power supply, a high quality variable switching DC power supply with outputs that are continuously adjustable at 0-50V DC and 0-5A. What's more, the two outputs can be used either in independent, series or parallel mode, providing either two independent outputs, or one output with twice the voltage or twice the current output, up to 100V or 10A. The unit can be operated in either constant voltage or constant current mode, and comes with dual LED displays, providing accurate readout of the two outputs.